Robinson is chair of music education at the Michigan State University College of Music and has written extensively about Betsy DeVos and her history in Michigan. In “Privatize, Monetize, Weaponize: How the DeVos family devoured Michigan’s schools,” Robinson writes that while some were surprised by Trump’s nomination of Devos, “public school teachers and supporters in Michigan weren’t surprised at all. 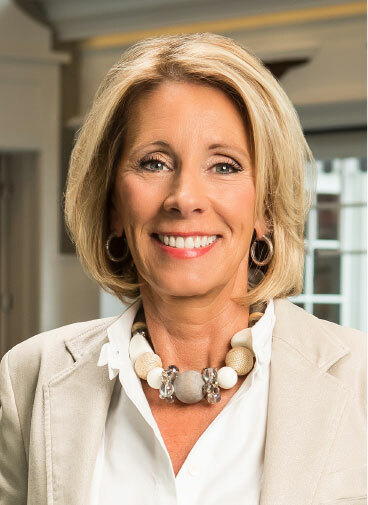 They saw Ms. DeVos’ ascendancy to this lofty position as the final piece in an elaborately constructed jig saw puzzle that the DeVos family has been patiently working on, at their opulent vacation homes and on their luxury yacht, for the last couple of decades. And now that the final piece has been added, we will all soon see the ‘big picture’ of the DeVos’ vision for the future of American education: Privatize, Monetize, Weaponize. 1. Destroy the Democrats biggest single source of financial support by gutting teacher unions via Right to Work legislation. 2. Capitalize on the elimination of the charter school ‘cap’ to explode the number of non-regulated and for-profit charter schools in the state. 3. Use charter schools as the mechanism to ‘blur the lines’ between public and private/religious schools.